With its delicate look, this bracelet adds a very feminine touch to your outfit. It has a lacy motif which gives a suple feel and a romantic look. It measures approximatelly 3/4 in (1.9 cm) width and 7 3/4 in (20 cm) length and it weights 28.5 gr (0.96 oz). 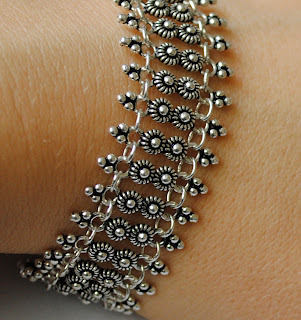 This beautiful bracelet is hand crafted in Beypazari,a small town near the capital of Turkey, Ankara. Beypazari is famous for its remarkable and distinguished silver craftmanship schools that dates back from the old times of the Ottoman empire. The secrets of this craftmanship is passed from father to son for centuries. You can order this bracelet here (from etsy.com) for USD 89.99.